What’s the verdict: Owing a big debt to John Fowles’ classic novel The Collector (turned into a memorable Terence Stamp/Samantha Eggar movie), Pet is premium grade pulp horror. 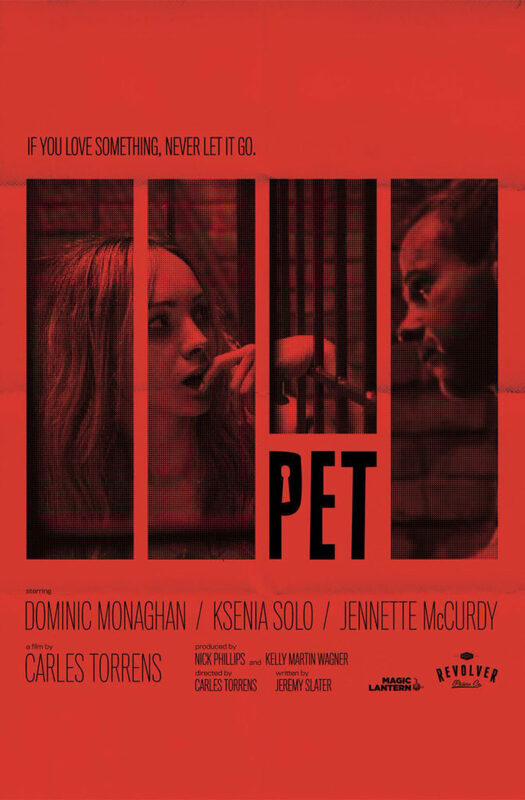 Dominic Monaghan delivers a wonderfully David Brent-ian turn as lonely dog lover Seth, sensing a spark between him and coolly beautiful former classmate Holly, Ksenia Solo delivering an effective, layered performance. Clearly orbiting Planet Travis Bickle in the depths of his delusion, Seth’s wide-smiled social awkwardness makes for genuinely squirmy moments as Holly moves from politely dismissive to actively hostile. A slow build of embarrassment and nervous tension accelerates into a proper slice of horror when the lonely sad sack makes his violent move on the unattainable woman. Screenwriter Jeremy Slater (co-writer of the ill-fated 2015 Fantastic Four reboot and the underappreciated The Lazarus Effect) goes beyond the “trapped girl” schtick of Captivity, Wolf Creek and The Last House on the Left. Twists, surprises and back and forth power shifts make this a riveting battle of wits and nerve, whose secrets are best left to discover for yourself. Apartment 143 helmer Carles Torrens directs his sophomore feature with an askew world view of isolating compositions, steely, high key lighting, symbolic mirror imagery, and clear, crisply lit visuals when the outrageous blood-letting erupts. From the clever opening shot to the haunting final moments, this is one Pet that’s for life.